Power Rangers fans know that HyperForce is already part of the Shattered Grid canon, but now there are even closer ties between them. Spoilers incoming for Mighty Morphin Power Rangers #29, so if you haven't read the issue yet you've been warned. Thanks to Lord Drakkon's constant drain on the Morphin Grid, the barriers between worlds are as thin as they have ever been. While he uses that to power his armies, Zordon uses that thinning of the barriers to send a signal to any Ranger still out there, and they more than answer the call. The roster is pretty impressive, but the best part just might be that it includes the HyperForce Rangers. That's right, team HyperForce makes its comic debut in Power Rangers #29. The crew has been featured on several covers, but this is the first time they are actually spotlighted within the comics' pages. 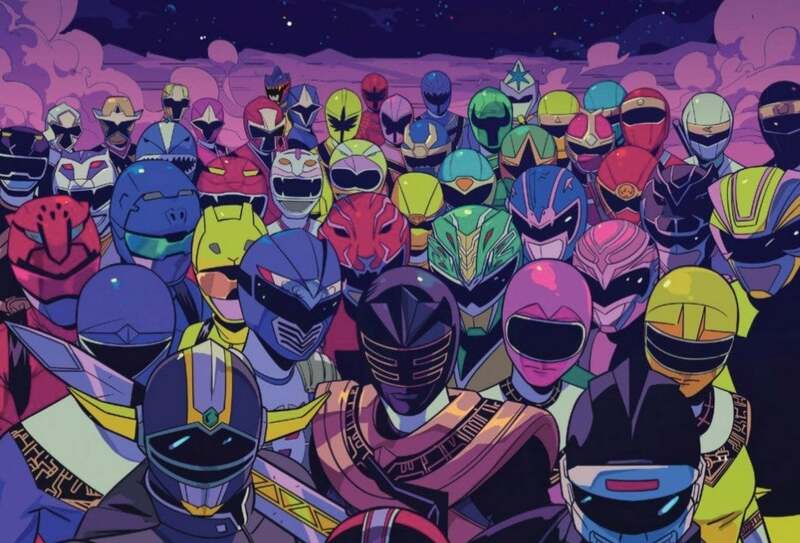 Marv (HyperForce Red), Chloe (HyperForce Pink), Jack (HyperForce Yellow), Eddie (HyperForce Blue), Vesper (HyperForce Black), and Joe (HyperForce Green) are all accounted for on the right-hand side of the image, and it's pretty damn amazing to see them alongside some of the franchise's greatest Rangers. You can find the spoiler image above. HyperForce was already an official part of Shattered Grid thanks to that epic two-part episode that featured Kyle Higgins and Jason David Frank. It's also been represented in the comics via linked plot points, like the fact that Skull turned out to be the Red Sentry defector seen in the show. Having them actually here though is one step further, and we can't wait to see what happens next. HyperForce starts out in the year 3016 at the Time Force Academy and features a team of Time Force Ranger cadets that must band together to defeat an ancient evil who is messing with the timestream. Under the leadership of their mentor, Jen Scott (Time Force's Erin Cahill), the newly minted Rangers will cross both time and space to complete their mission while running into many familiar eras (and faces) along the way. Mighty Morphin Power Rangers #29 is written by Kyle Higgins and drawn by Daniele Nicuolo and Walter Baiamonte with a cover by Jamal Campbell. "The Mighty Morphin Power Rangers and their allies prepare their final counterattack against Drakkon, as a new ally makes it through their world and Zordon makes a last-ditch call for help." Mighty Morphin Power Rangers #29 is in comic stores on July 18. You can also hit me up at @MattMuellerCB on Twitter for more Power Rangers coverage!